I have a music degree and experience with a variety of ages and levels. 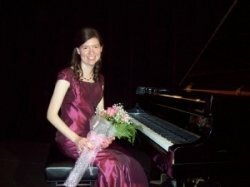 I received a bachelor’s degree in piano pedagogy in 2012. I am happy to accomodate students who wish to take exams but also enjoy teaching young children and beginners. I also have taught special needs students. Theory, composition, improvisation, ear training and sight-singing are encouraged during piano lessons. Lessons are in a traditional/Classical style. I enjoy seeing students reach personal goals.